New Chapter 11 Bankruptcy Filing - Achaogen Inc.
Biopharma is where it’s at!! Achaogen designed its lead product, ZEMDRI® (plazomicin), to fight what the Center for Disease Control (“CDC”) calls a “nightmare bacteria” and has listed as the highest category threat of “urgent.” ZEMDRI can be used to treat patients who have limited or no alternative treatment options from infections with these nightmare bacteria. 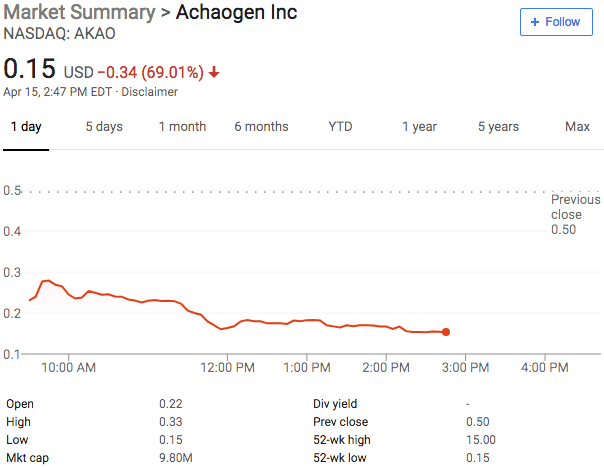 Even with its current financial situation, Achaogen continues to commercialize ZEMDRI, in part because Achaogen believes that ZEMDRI can save lives for patients who may literally have no alternative. Nightmare bacteria!! Sheesh that’s chilling. Even more chilling is the company’s discussion of gram-negative bacteria — found “everywhere, in virtually all environments on Earth that support life.” These bacteria are becoming increasingly resistant to common antibiotics. Achaogen calls this “a global crisis…we take for granted.” The company’s core (patented) product, ZEMDRI, is designed to “retain its effectiveness in killing these more resistant bacteria.” While ZEMDRI received FDA approval for IV-treatment of patients with complicated urinary tract infections in July 2018, the FDA rejected ZEMDRI for treatment of patients with bloodstream infections, citing a lack of substantial evidence of effectiveness. What does the company have going for it? Again, as of July 2018, it has a commercially viable product in the United States. It also has global commercialization rights. And patent protect in the US through approximately 2031 or 2032. It sells to either specialty distributors or physician-owned infusion centers. It has agreements with Hovione Limited and Pfizer for the manufacturing of its product. Finally, it has another product in development, C-Scape, which is an oral antibiotic for treatment of patients suffering from urinary tract infections caused by a particular bacteria. In the past year, there has been a dramatic downturn in the availability of financing from both the debt and equity markets for companies in the anti-infective field, based in part on the withdrawal from the space by certain large pharmaceutical companies. For example, Novartis recently announced that it is shutting down its antibacterial and antiviral research, which was followed by similar moves from Eli Lilly, Bristol-Myers Squibb and AstraZeneca.3 Allergan has also recently announced its intention to divest its anti-infective business, consisting of three commercialized products. This “big pharma flight” from antiinfective research, development and commercialization has created significant challenges for early-stage biotech companies seeking to develop and commercialize novel and much needed drugs in this sector, as opportunities for partnerships, joint R&D relationships, and merger/acquisition transactions have diminished. This sector-wide trend has negatively affected not just Achaogen but many of its competitors. Achaogen, however, has been especially impacted because it has reached the point in its life cycle where it needs substantial capital infusion to drive commercialization of its recently FDA approved drug, ZEMDRI. Look: we don’t take everything debtors say as gospel. After all, first day pleadings are an opportunity to frame the story and set the tone of a case. But if the company is right about what it’s saying and nobody appears to give two sh*ts, well, color us a wee bit concerned. Why isn’t anybody talking about this? Anyway, in February 2018, the company entered into a loan and security agreement with Silicon Valley Bank for $50mm. The original agreement provided SVB with a security interest in virtually all of the company’s assets — including proceeds of intellectual property — but not a security interest in the IP itself. $15mm remains outstanding under the loan. In November 2018, the company retained Evercore Group LLP to run a strategic sale process but no viable purchaser emerged. It’s not worth saving the world unless you can make some dinero, we suppose. After engaging in various liquidity maximization efforts (including job cuts), fundraising initiatives (including an insufficient equity raise), and licensing discussions with entities abroad, the company ultimately decided that nothing would generate enough liquidity for the company to avoid chapter 11. The company notes, “although Achaogen’s out-of-court sale process did not yield any acceptable bids, many parties had expressed interest in bidding at any potential 363 auction sale, where it could pursue the Assets free and clear of existing liabilities.” The company, therefore, filed for chapter 11 to pursue a new sale process; it has no stalking horse bidder teed up. To market its assets, the company has replaced Evercore with Cassel Salpeter & Co. LLC. In support of the bankruptcy case, SVB committed to provide the company with a $25mm DIP credit facility of which $10mm is new money and $15mm is a roll-up of the aforementioned pre-petition debt. In exchange, SVB now gets a security interest in the company’s IP. But it’s pretty darn close. Now the issue is what price the IP will fetch in a bankruptcy sale process. It will have to be tens of millions of dollars for NEA to have any sort of recovery. Biopharma, DofDelaware, Judge Shannon, Hogan Lovells, Morris Nichols Arsht & Tunnell LLP, Meru LLC, KCC, Silicon Valley Bank, Morrison & Foerster LLP, Ashby & Geddes, Cassel Salpeter & Co. LLC, New Enterprise Associates Inc., Evercore, Pfizer Inc.
What we appreciate that and, we hope thanks to PETITION, others will eventually come to appreciate, is that there is a lot to learn from the special corporate law, investment banking, advisory, and investing niche labeled “restructuring” and “distressed investing.” Here, Ohio-based Hexion Holdings LLC is a company that probably touches our lives in ways that most people have no knowledge of: it produces resins that “are key ingredients in a wide variety of industrial and consumer goods, where they are often employed as adhesives, as coatings and sealants, and as intermediates for other chemical applications.” These adhesives are used in wind turbines and particle board; their coatings prevent corrosion on bridges and buildings. You can imagine a scenario where, if Washington D.C. can ever get its act together and get an infrastructure bill done, Hexion will have a significant influx of revenue. (PETITION Note: if you’re wondering what the eff is a 1.5 lien note, well, welcome to the party pal. These notes are a construct of a frothy high-yield market and constructive readings of credit docs. They were issued in 2017 to discharge maturing notes. The holders thereof enjoy higher priority on collateral than the second lien notes and other junior creditors below, but slot in beneath the first lien notes). Anyway, to remedy this issue, the company has entered into a support agreement “that enjoys the support of creditors holding a majority of the debt to be restructured, including majorities within every tier of the capital structure.” The agreement would reduce total funded debt by $2b by: (a) giving the first lien noteholders $1.45b in cash (less adequate protection payments reflecting interest on their loans), and 72.5% of new common stock and rights to participate in the rights offering at a significant discount to a total enterprise value of $3.1b; and (b) the 1.5 lien noteholders, the second lien noteholders and the unsecured noteholders 27.5% of the new common stock and rights to participate in the rights offering. The case will be funded by a $700mm DIP credit facility. *Interestingly, Hexion is a derivative victim of the oil and gas downturn. In 2014, the company was selling resin coated sand to oil and gas businesses to the tune of 8% of sales and 28% of segment EBITDA. By 2016, segment EBITDA dropped by approximately $150mm, a sizable loss that couldn’t be offset by other business units. Orchids Paper Products Company ($TIS) is a Okahoma-based producer of bulk tissue paper which is later converted into finished products like paper towels, toilet paper and paper napkins; it sells its products for use in the “at home” market under private label to dollar stores, discount retailers and grocery stores. Its largest customers include the likes of Dollar General Corp. ($DG), Walmart Inc. ($WMT) and Family Dollar/Dollar Tree, which, combined, account for over 60% of the company’s sales. Given the rise of the dollar stores and discount retailers and the rise in private label generally, you’d think that this company would be killing it. Spoiler alert: it’s not. In fact, it is, by definition, insolvent. This company doesn’t produce enough toilet paper to wipe away this sh*tfest. See you in bankruptcy court. And that’s precisely where they (and affiliates) are now — in the District of Delaware. And the story hasn’t really changed: the debtors still struggle from operational issues related to their facilities, too much competition (causing margin compression and loss of pricing power), rising input costs, and customer defections. To make matters worse, given the debtors’ deteriorating financial position, raw materials suppliers reduced credit terms given the debtors’ public reporting of its troubles. Consequently, virtually all of the debtors’ financial metrics got smoked. Gross profit? Smoked. Cash flow? Smoked. Net income? Smoooooooked. Speaking of “smooooooked,” the company twice notes its termination of their investment banker, Guggenheim Securities. Bankers get replaced all of the time: not entirely sure why they felt the need to make such an issue of it here. That said, Guggenheim apparently marketed the company for months without finding a prospective buyer that would clear the debt. The company, therefore, hired Houlihan Lokey ($HL) to market the company. The result? They couldn’t find a buyer that would clear the debt. Nothing like paying a new banker AND presumably paying some sort of tail to your old banker just to end up with your pre-petition secured lender as your stalking horse bidder (and DIP lender)! Sheesh. Investment Banker: Houlihan Lokey Capital Inc.
We’ve been noting — in “⛽️Is Oil & Gas Distress Back?⛽️“ (March 6) and “Oil and Gas Continues to Crack (Long Houston-Based Hotels)“ (March 24) that oil and gas was about to rear its ugly head right back into bankruptcy court. Almost on cue, Vanguard Natural Resources Inc. filed for bankruptcy in Texas on the last day of Q1 and, here, Southcross Energy Partners LP kicked off Q2. Dallas-based Southcross Energy Partners LP is a publicly-traded company ($SXEE) that provides midstream services to nat gas producers/customers, including nat gas gathering, processing, treatment and compression and access to natural gas liquid (“NGL”) fractionation and transportation services; it also purchases and sells nat gas and NGL; its primary assets and operations are located in the Eagle Ford shale region of South Texas, though it also operates in Mississippi (sourcing power plants via its pipelines) and Alabama. It and its debtor affiliates generated $154.8mm in revenues in the three months ended 09/30/18, an 11% YOY decrease. Why are the debtors in bankruptcy? Because natural gas prices collapsed in 2015 and have yet to really meaningfully recover — though they are up from the $1.49 low of March 4, 2016. As we write this, nat gas prices at $2.70. These prices, combined with too much leverage (particularly in comparison to competitors that flushed their debt through bankruptcy) and facility shutdowns, created strong headwinds the company simply couldn’t surmount. It now seeks to use the bankruptcy process to gain access to much needed capital and sell to a buyer to maximize value. The company does not appear to have a stalking horse bidder lined up. The debtors have a commitment for $137.5mm of new-money post-petition financing to fund its cases. Use of proceeds? With the agreement of its secured parties, the debtors seek to pay all trade creditors in the ordinary course of business. If approved by the court, this would mean that the debtors will likely avoid having to contend with an official committee of unsecured creditors and that only the secured creditors and holders of unsecured sponsor notes would have lingering pre-petition claims — a strong power move by the debtors. New Chapter 11 Bankruptcy Filing - F+W Media Inc.
WAAAAAAY back in September 2018, we highlighted in our Members’-only piece, “Online Education & ‘Community’ (Long Helen Mirren),” that esteemed author and professor Clayton Christensen was bullish about the growth of online education and bearish about colleges and universities in the US. We also wrote that Masterclass, a SF-based online education platform that gives students “access” to lessons from the likes of Helen Mirren(acting), Malcolm Gladwell (writing) and Ken Burns (documentary film making) had just raised $80mm in Series D financing, bringing its total fundraising to $160mm. Online education is growing, we noted, comporting nicely with Christensen’s thesis. Yet, not all online educational tools are killing it. Take F+W Media Inc., for instance. F+W is a New York-based private equity owned content and e-commerce company; it publishes magazines, books, digital products like e-books and e-magazines, produces online video, offers online education, and operates a variety of e-commerce channels that support the various subject matters it specializes in, e.g., arts & crafts, antiques & collectibles, and writing. Writer’s Digest is perhaps its best known product. Aspiring writers can go there for online and other resources to learn how to write. For the last several years F+W has endeavored to shift from its legacy print business to a more digital operation; it is also beginning to show cracks. Back in January, the company’s CEO, COO and CTO left the company. A media and publishing team from FTI Consulting Inc. ($FTI) is (or at least was) embedded with new management. The company has been selling non-core assets (most recently World Tea Media). Its $125mm 6.5% first lien term loan due June 2019 was recently bid at 63 cents on the dollar (with a yield-to-worst of 74.8% — yields are inversely proportional to price), demonstrating, to put it simply, a market view that the company may not be able to pay the loan (or refinance the loan at or below the current economics) when it comes due. On March 10, 2019, F+W Media Inc., a multi-media company owning and operating print and digital media platforms, filed for chapter 11 bankruptcy in the District of Delaware along with several affiliated entities. We previously highlighted Writer’s Digest, but the company’s most successful revenue streams are its “Crafts Community” ($32.5mm of revenue in 2018) and “Artist’s Network” ($.8.7mm of revenue in 2018); it also has a book publishing business that generated $22mm in 2018. In terms of “master classes,” the bankruptcy papers provide an intimate look into just how truly difficult it is to transform a legacy print business into a digital multi-media business. Over the past decade, the market for subscription print periodicals of all kinds, including those published by the Company, has been in decline as an increasing amount of content has become available electronically at little or no cost to readers. In an attempt to combat this decline, the Company began looking for new sources of revenue growth and market space for its enthusiast brands. On or around 2008, the Company decided to shift its focus to e-commerce upon the belief that its enthusiast customers would purchase items from the Company related to their passions besides periodicals, such as craft and writing supplies. With its large library of niche information for its hobbyist customers, the Company believed it was well-positioned to make this transition. In connection with this new approach, the Company took on various additional obligations across its distribution channel, including purchasing the merchandise it would sell online, storing merchandise in leased warehouses, marketing merchandise on websites, fulfilling orders, and responding to customer service inquiries. Unfortunately, these additional obligations came at a tremendous cost to the Company, both in terms of monetary loss and the deterioration of customer relationships. As a consequence of this shift in strategic approach, the Company was required to enter into various technology contracts which increased capital expenditures by 385% in 2017 alone. And, because the Company had ventured into fields in which it lacked expertise, it soon realized that the technology used on the Company’s websites was unnecessary or flawed, resulting in customer service issues that significantly damaged the Company’s reputation and relationship with its customers. By example, in 2018 in the crafts business alone, the Company spent approximately $6 million on its efforts to sell craft ecommerce and generated only $3 million in revenue. As if that cash burn wasn’t bad enough, in 2013 the company entered into a $135mm secured credit facility ($125mm TL; $10mm RCF) to fund its operations. By 2017, the company owed $99mm in debt and was in default of certain covenants (remember those?) under the facility. Luckily, it had some forgiving lenders. And by “forgiving,” we mean lenders who were willing to equitize the loan, reduce the company’s indebtedness by $100mm and issue a new amended and restated credit facility of $35mm (as well as provide a new $15mm tranche) — all in exchange for a mere 97% of the company’s equity (and some nice fees, we imagine). Savage! The Company utilized its improved liquidity position as a result of the Restructuring to continue its efforts to evolve from a legacy print business to an e-commerce business. However, largely as a result of mismanagement, the Company exhausted the entire $15 million of the new funding it received in the six (6) months following the Restructuring. In those six (6) months, the Company’s management dramatically increased spending on technology contracts, merchandise to store in warehouses, and staffing while the Company was faltering and revenue was declining. The Company’s decision to focus on e-commerce and deemphasize print and digital publishing accelerated the decline of the Company’s publishing business, and the resources spent on technology hurt the Company’s viability because the technology was flawed and customers often had issues with the websites. What happened next? Well, management paid themselves millions upon millions of dollars in bonuses! Ok, no, just kidding but ask yourself: would you have really been surprised if that were so?? Instead, apparently the board of directors awoke from a long slumber and decided to FINALLY sh*tcan the management team. The board brought in a new CEO and hired FTI Consulting Inc. ($FTI) to help right the ship. They quickly discovered that the e-commerce channel was sinking the business (PETITION Note: this is precisely why many small startup businesses build their e-commerce platforms on top of the likes of Shopify Inc. ($SHOP) — to avoid precisely the e-commerce startup costs and issues F+W experienced here.). Realizing that periodic asset sales are not a long-term operational solution, the Company’s board requested alternative strategies for 2019, ranging from a full liquidation to selling a significant portion of the Company’s assets to help stabilize operations. Ultimately, the Company determined that the only viable alternative, which would allow it to survive while providing relief from its obligations, was to pursue a sale transaction within the context of a chapter 11 filing. Greenhill & Co. Inc. ($GHL) is advising the company with respect to a sale of the book publishing business. FTI is handling the sale of the company’s Communities business. The company hopes both processes are consummated by the end of May and middle of June, respectively. The company secured an $8mm DIP credit facility to fund the cases. Judge Gross said he didn’t want to play “chicken” with the lenders, but that he didn’t believe they should use the bankruptcy financing to recoup what they were owed before the chapter 11 filing. Wow. Finally some activist push-back on excessive bankruptcy fees! Better late than never. Investment Banker: Greenhill & Co.
DIP Lenders: Drawbridge Special Opportunities Fund LP, New F&W Media M Holdings Corp LLC, PBB Investments III LLC, CION Investment Corporation, Ellington Management Group, or affiliates thereof to be determined. New Chapter 11 Bankruptcy Filing - DIESEL USA, Inc.
More surprising than the company filing for bankruptcy is the law firm filing it for bankruptcy. Arent Fox LLP, while a fine firm for sure, isn’t exactly known for its debtor-side chops. Just saying. In 2018: $38mm for full-price retail and $34.5mm for outlet (Total: $72.5mm). In 2018: brick and mortar represented 70% of net sales. We see a couple of significant problems here. …in 2015 prior management implemented a strategic initiative that was focused on repositioning Diesel stores and products in premium locations and with premium customers so as to place them side-by-side with other premium fashion brands across the retail, online, and wholesale platforms. Unfortunately, since its implementation, the Debtor’s net sales have significantly decreased while its losses have significantly increased. As is common in the retail industry, the Debtor provides certain customers with allowances for markdowns, returns, damages, discounts, and cooperative marketing programs (collectively, the “Chargebacks”). If the Debtor’s customers fail to sell the Debtor’s products, they generally have the right to return the goods at cost or issue Chargebacks, which are netted against the Debtor’s accounts receivable. Due to mounting Chargebacks from wholesale customers, the Debtor was forced to significantly reduce its wholesale activities in recent years. Basically, nobody is buying this sh*t. Not in stores. Not in wholesale. The primary means of implementing the 2015 strategy was to reposition the Debtor’s full-price retail and outlet stores to “premium”, high-profile, and high-visibility locations, which was executed by opening certain new stores and relocating others to “premium” locations while closing others deemed not to fit the new strategic positioning model. The result was, despite the losses suffered in connection with the Fifth Avenue store, management’s negotiation and entry into several expensive, long-term leases for certain of the Debtor’s retail locations, such as the Debtor’s “Flagship” store on Madison Avenue, which do not expire by their terms until 2024-2026. Of course, it was then (and remains today) an inopportune time to make long-term commitments to costly retail leases and the significantly increased lease expenses have not been offset by increased sales, which, in fact, have dropped precipitously. …numerous of the Debtor’s stores are producing heavy losses. The Debtor’s unprofitable stores combined to produce negative EBITDA of approximately $10.7 million in 2018, nearly all of which flowed from full-price retail stores. The Debtor’s profitable stores are not enough to off-set the losses, as the 17 fullprice stores combined to produce negative EBITDA of approximately $8.7 million in 2018. Now, the company does indicate that certain (seemingly outlet) stores remain profitable, as do the wholesale and e-commerce operations. *** So, there’s that. New management is in place and their plan includes (a) using the BK to negotiate with landlords, shutter some locations, shutter and relocate others, opening new smaller stores and refit existing locations; (b) deploying influencer marketing generally and aiming more efforts towards females (and hoping and praying that athleisure — a term we didn’t see ONCE in the entire first day declaration — doesn’t continue to hold sway and steer people away from jeans, generally);**** (c) growing e-commerce; and (d) revitalizing the wholesale business with key selective wholesale partners. This plan is meant to take hold in the next three years and “will require significant capital investments.” (PETITION Note: cue the chapter 22 preparation). The company intends to effectuate its new business plan via a plan of reorganization pursuant to which it will reject certain executory contracts. All in, the company hopes to be confirmed in roughly 5 weeks. Aggressive! But, like Mattress Firm, trade creditors are “current” and there’s no debt otherwise, so the schedule isn’t entirely out of the realm of possibility. The Debtor’s projections indicate that the Reorganization Business Plan will return the Debtor to stand-alone profitability by 2021 assuming successful store closures through this Chapter 11 Case, thereby ensuring its ability to continue operating as a going-concern, saving over 300 jobs, and creating new ones through the new store openings. Generally, we’ll take the under. Though, we have to say: at least they’re not audaciously projecting a miraculous profit in 2019. How will they achieve all of these lofty goals? The company’s foreign parent will invest $36mm over the three-year period of the business plan because…well…why the hell not? Everyone loves a Hail Mary. **The company doesn’t appear to have put much into its e-commerce growth. While e-commerce now represents 12% of net sales, sales are only incrementally higher in absolute numbers (from $8mm in 2014 to $12mm in 2018). The wholesale channel, on the other hand, has gone in the opposite direction. Net sales went from $61mm (2014) to $19mm (2018) and now represent only 19% of net sales (down from 32%). ***It seems, though, that outlet stores, wholesale and e-commerce resulted in negative $2mm EBITDA if the math from the above quote is correct. Curious. ****Score for Facebook Inc. ($FB)! New Chapter 11 Bankruptcy Filing - Pernix Therapeutics/Pernix Sleep Inc. In our January 30th Members’-only briefing entitled “😢Who Will Remember Things Remembered?😢 ,” we included a segment subtitled “Pharma Continues to Show Distress (Long Opioid-Related BK)” in which we discussed how Pernix Therapeutics Holdings Inc. ($PTX) looked like an imminent bankruptcy candidate. We noted how the company had previously staved off bankruptcy thanks to a refinancing transaction with Highbridge Capital Management. That refinancing now looks like a perfectly-executed loan-to-own strategy: Phoenix Top Holdings LLC, an affiliate of Highbridge, will serve as the stalking horse bidder of the company’s assets in exchange for $75.6mm plus the assumption of certain liabilities. Highbridge will also, after a competitive process pitted against other debtholders like Deerfield Management Company LP, provide the Debtors with a $34.1mm DIP facility — of which $15mm is new money, $5mm is an accordian facility, and the rest is a roll-up of the pre-petition ABL. Capital Structure: see link above. New Chapter 11 Bankruptcy Filing - Imerys Talc America Inc.
PG&E Corporation's ($PCG) recent liability-based bankruptcy filing got us thinking: what other companies are poised for a litigation-based chapter 11 bankruptcy filing? We think we have a winner. Imerys S.A. is a French multinational company that specializes in the production and processing of industrial minerals. Its North American operations are headquartered in Roswell, Georgia and in San Jose, California. Included among Imerys' North American operations is Imerys Talc America. The key word in all of the foregoing is "Talc." If only we had purchased a lottery ticket. Although personal care/cosmetic sales make up only approximately 5% of the Debtors’ revenue, approximately 98.6% of the pending Talc Claims allege injuries based on use of cosmetic products containing talc. Whoa. What a number!! What a disparity! Low revenues and yet high claims! What a sham! That just goes to show how absurd these claims are!! Just kidding. That sentence means absolutely nothing: it is clearly an attempt by lawyers to ignorantly wow people with percentages that have absolutely no significance whatsoever. Who gives a sh*t whether personal care/cosmetic sales are only a small fraction of revenues? If those sales are all laced with toxic crap that are possibly causing people cancer or mesothelioma, the rest is just pixie dust. In fact, it’s possible that 100% of 1% of sales are causing cancer, is it not? …while the Debtors have access to valuable insurance assets that they have relied on to fund their defense and appropriate settlement costs to date, the Debtors have been forced to fund certain litigation costs and settlements out of their free cash flow due to a lack of currently available coverage for certain Talc Claims, or insurers asserting defenses to coverage. The Debtors lack the financial wherewithal to litigate against the mounting Talc Claims being asserted against them in the tort system. While certain cases are running into roadblocks, the prior verdicts call into question whether Imerys has adequate insurance coverage to address the various judgments. If not, the company is likely headed into bankruptcy court — the latest in a series of cases that will attempt to deploy bankruptcy code section 524's channeling injunction and funnel claims against a trust. The Debtors’ primary goal in filing these Chapter 11 Cases is to confirm a consensual plan of reorganization pursuant to Sections 105(a), 524(g), and 1129 of the Bankruptcy Code that channels all of the present and future Talc Claims to a trust vested with substantial assets and provides for a channeling injunction prohibiting claimants from asserting against any Debtor or non-debtor affiliate any claims arising from talc mined, produced, sold, or distributed by any of the Debtors prior to their emergence from these Chapter 11 Cases. While the Debtors dispute all liability as to the Talc Claims, the Debtors believe this approach will provide fair and equitable treatment of all stakeholders. The comparisons to PG&E were on point. Capital Structure: $14.4mm inter-company payable. Future Claims Representative: James L. Patton Jr.
Geez. All the action these days is in busted retail and busted pharma. Here, Avadel Specialty Pharmaceuticals LLC ("ASP") is a MIssouri-based pharmaceutical company engaged in the business of the distribution, sale and marketing of pharmaceutical products focused on chronic urological disorders. It has one product, NOCTIVA. In other words, it is not a manufacturer; it has an exclusive license from Serenity Pharmaceuticals LLC to develop, market and sell NOCTIVA in the US and Canada. The company paid $70mm for the license and Serenity maintained some option value as well, including the right to receive potential milestone payments and royalties from product sales. "ASP has experienced several market challenges in its efforts to commercialize and increase sales volume while the overall growth for its product has been slower than anticipated. As a result, ASP has experienced losses since its inception, and as of the Petition Date, has an accumulated deficit, due in part to costs relating to underachieving sales, unanticipated competition, and certain supply agreements. Making matters worse, sales projections based on the current growth trend illustrate a substantially longer period of operating losses than originally assumed." Or said another way, among other issues, doctors seem unwilling to prescribe NOCTIVA to their worst enemies. Per the company, "health care professionals ahve been unwillint to try (or adop) NOCTIVA." Why not? Well, for starters, there are other agents that physicians use to target the conditions NOCTIVA is formulated to tackle. Moreover, there are "underlying concerns with regard to the potential risks of a serious side effect associated with the active ingredient in NOCTIVA™ (desmopressin acetate), based on prior experience with older formulations of the same active ingredient…." Uh, yeah, that sounds sketchy AF. And so this thing has been a money pit. The company's direct (non-debtor) parent has funded approximately $152mm since September 2017 to support the business including $80mm in additional investment that have yielded less than $3mm in net sales. How's that for ROI? As you can probably imagine, that ROI proposition was enough to finally compel ASP's direct parent to stop funding it. Consequently, the company sought to perform triage, first by trying (and failing) to locate a co-promoter and, second, by sublicensing its obligations. But, no dice. it filed for bankruptcy to sell its assets and wind down its operations. The bankruptcy constitutes just one part in the overall restructuring efforts of ASP's indirect parent, Avadel Pharmaceuticals plc. The case will be funded, if approved, by a $2.7mm DIP revolving credit facility and $2.7mm unsecured DIP, both provided by the company's non-debtor indirect parent. This is the week of proposed super-short bankruptcy cases. Pennsylvania-based natural-gas developer, Arsenal Energy Holdings LLC, filed a prepackaged bankruptcy case in the District of Delaware. Pursuant to its prepackaged plan of reorganization, the company will convert its subordinated notes to Class A equity. Holders of 95.93% of the notes approved of the plan. The one holdout — the other 4+% — precipitated the need for a chapter 11 filing. Restructuring democracy is a beautiful (and sometimes wasteful) thing. 100% of existing equity approved of the plan and will get Class B equity (with the exception of Arsenal Resource Holdings LLC and FR Mountaineer Keystone Holdings LLC, which will both get Class C equity). The company, itself, is about as boring a bankruptcy filer as they come: it is just a holding company with no ops, no employees and, other than a single bank account and its direct and indirect equity interests in certain non-debtor subs, no assets. The equity is privately-held. More of the action occurred out-of-court upon the recapitalization of the non-debtor operating company. Because of the holdout(s), the company, its noteholders, the opco lenders (Mercuria) and the consenting equityholders agreed to consummate a global transaction in steps: first, the out-of-court recap of the non-debtor opco and then the in-court restructuring of the holdco to squeeze the holdouts. For the uninitiated, a lower voting threshold passes muster in-court than it does out-of-court. Out-of-court, the debtor needed 100% consent. Not so much in BK. Given the simplicity of this case, the company hopes to be in and out of bankruptcy in less than two weeks. Which, considering the effort in FULLBEAUTY, begs the question: why is it taking so long? Prepack, Natural Gas, DofDelaware, Simpson Thacher, Young Conaway, Prime Clerk LLC, Cleary Gottlieb, Vinson & Elkins LLP, Mercuria Investments US Inc.
New Chapter 11 Bankruptcy Filing - Consolidated Infrastructure Group Inc.
Nebraska-based Consolidated Infrastructure Group Inc. filed for bankruptcy last week in the District of Delaware; it provides underground utility and damage prevention services to players in the underground construction, digging and maintenance space. It serves or served large telecom and utility companies, such as AT&T, Cox Communications, and Comcast. it also currently has contracts with the Northern Indiana Public Service Company, the City of Davenport in Iowa and with ONE Gas Inc. The company has little in the way of assets and liabilities. Relating to the former, the company has the above-noted contracts, a $3mm receivable from AT&T, some intellectual property and interests in insurance policies. Liabilities include two letters of credit, and a small unsecured advance by prepetition equityholder and now-postpetition DIP lender ($3mm), Parallel149, a private equity firm. The company has been embroiled in drama since its inception in 2016. It was formed by former employees of USIC LLC, a much-larger competitor, and the two have been locked up in litigation relating to, among other things, breach of contract (non-compete). The company filed for bankruptcy to pursue a going concern 363 sale and liquidating plan. It also hopes to recover the AT&T receivable. Finally, it also contends that a sale of the contracts would avoid a public safety crisis in the communities where the company's contracts are located. Michigan-based Maremont Corporation, a subsidiary of publicly-traded non-debtor automobile component manufacturer Meritor Inc. ($MTOR), has filed for bankruptcy along with three affiliates in the District of Delaware. The company was a manufacturer, distributor and seller of aftermarket auto products — many of which contained asbestos; currently, it has no ongoing operations and its only assets are an intercompany receivable, a rent-producing commercial property with Dollar General as a tenant, a few bank accounts, and some insurance assets. In contrast, the company has significant liabilities — notably asbestos-related liabilities including defense and other costs associated with defending 13k pending personal injury and wrongful death claims. The company, in consultation with its parent and committees of Future Claimants and current Asbestos Claimants, arrived at a prepackaged plan under section 524(g) of the Bankruptcy Code. The plan envisions a personal injury trust to be funded, in large part, by Meritor (via the repayment of a remaining receivable, a contribution of intercompany payables and a $28mm settlement payment) and a channeling injunction that protects the company (and Meritor) from future suit and liability arising out of the company’s asbestos legacy. Instead, any and all asbestos-related personal injury claims may only be pursued against, and paid from, the personal injury trust. 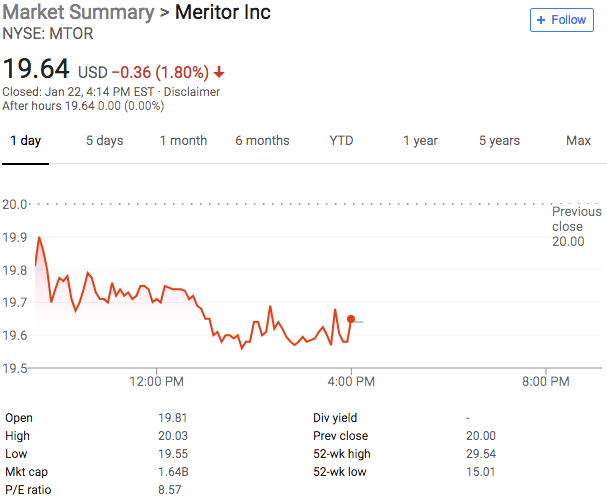 Meritor, like most of the stock market, got beaten up yesterday. There’s no telling whether the multi-million dollar payout here had anything to do with that. For the uninitiated, this (horrifically boring) bankruptcy filing presents us with a good opportunity to highlight a potential structure (and its limitations) for any imminent Pacific Gas & Electric Company (“PG&E”) chapter 11 bankruptcy filing. PG&E’s issues — as have, by this point, been extensively documented — largely emanate out of (i) some oppressive California state liability laws (inverse-condemnation — definitely), (ii) man-made global warming and resultant mudslides and wildfires (probably), and (iii) at least a glint of negligence (probably). While the company has $18.4b of (mostly unsecured) debt, the catalyst to bankruptcy may be its multi-billion dollar liability from the aforementioned CA-state laws and years of environmental disaster. There is one significant obstacle to any PG&E bankruptcy: the likely inability to discharge liabilities associated with wildfires that have not yet occurred. There have been numerous mass tort bankruptcies in the past that have been resolved through the formation of a litigation trust and channeling injunction, forcing litigants into a single forum where claims are satisfied through trust assets. See, e.g., 11 U.S.C. §524(g) (channeling injunction for asbestos debtors); In re TK Holdings, Doc. No. 2120, Case No. 17-11375 (Bankr D. Del.) (confirmation order with channeling injunction for debtor that manufactured airbags with defective components). But that structure only works for claims based on prior conduct or acts. PG&E, in contrast, faces perennial liability associated with wildfires and inverse condemnation. It may be challenging to discharge the inverse-condemnation liabilities associated with a post-petition wildfire. See 28 U.S.C. §959(a) (debtors-in-possession may be sued “with respect to any of their acts or transactions in carrying on business connected with such property.”). Prior conduct or acts, huh? A discontinued product that happened to contain asbestos fits that bill. Likewise, a remedied airbag (the TK Holdings referenced above refers to Takata Airbags). Sadly — especially for Californians, there is nothing prior about environmental issues. Those are very much a present and future thing. Future Claimants Representative: James L. Patton Jr.
On December 19, 2018, a week after Glossier CEO Emily Weiss revealed that the direct-to-consumer beauty brand hit $100mm in sales, Glansaol, a platform company that acquires, integrates and cultivates a portfolio of prestige beauty brands — including a direct-to-consumer brand — filed for bankruptcy in the Southern District of New York. Now, a Kansas City-based brick-and-mortar beauty retailer with 58 stores in 12 states, Beauty Brands LLC, filed for bankruptcy over the weekend in the District of Delaware. Though we’ve never heard of it, it is no small shop: the company generated $125mm of net sales for fiscal year ended February 3, 2018. 70% of its revenue came from retail products and 30% from salon and spa services. The company had an e-commerce platform that accounted for 6.2% of net sales. It does not own any real property, leasing each of its stores. Beauty Brands’ liquidity and financial position has been adversely affected by declining sales and rising costs associated with doing business as a predominantly “brick and mortar” retailer. These factors have adversely impacted the Debtors’ profitability and its liquidity, which in turn has made it increasingly difficult to source replenishment inventory, which in turn contributes to further declines in the Company’s sales. From 2014 through 2016, Beauty Brands unsuccessfully attempted to reposition its brand identity and store model by opening 11 new format store locations, which required significant capital expenditures, deferral of other investment opportunities, and management’s focus on the new format stores to the detriment of its existing store locations. These new format store locations, which remain operational, have underperformed Beauty Brands’ expectations and contributed to operating losses incurred by the Debtors. Despite pre-petition efforts to sell the company as a going concern, no buyers were forthcoming. Therefore, the company hired Hilco Merchant Resources LLC to commence a firm-wide liquidation. Nevertheless, the company holds out hope — given some 11th hour interest by two potential buyers — that it can auction approximately 33 of its stores (“Core Stores”). In the meantime, Hilco is pursuing “GOB” sales of the 23 remaining stores (“Closing Stores”)(PETITION Note: the company’s papers say there are 58 stores, and yet only 56 stores are accounted for in the company’s description of Core Stores and Closing Stores, though there is mention of one “Dark Store”). Hilco will also serve as the Stalking Horse Bidder for the Core Stores. The company will pursue a short post-petition marketing and sale process with an aim towards an early February 2019 sale. The company will use a committed $9mm DIP from pre-petition agent, PNC Bank NA, to fund the process. Claims Agent: Donlin Recano & Company Inc.
New Chapter 11 Bankruptcy Filing - LBI Media Inc. Happy Thanksgiving y’all!! LBI Media Inc. and several affiliates FINALLY filed for bankruptcy today in the District of Delaware after years of questions about its financial health. The company is a privately held minority-owned Spanish-language broadcaster that owns or licenses 27 Spanish-language television and radio stations in the largest US markets; it services the largest media markets in the nation, including Los Angeles, New York City, Chicago, Miami, Houston and Dallas. It is also a victim of disruption. The company notes that it has “faced the market pressures that have broadly affected U.S. television and radio broadcasters, including the 2008 recession and the diversion of advertising spend by companies to digital media.” Insert Facebook Inc. ($FB) here. That’s not all, though, of course: the company is also hampered by “a substantial debt load and corresponding interest expense obligations” which has stunted LBI’s financial performance, ability to invest and grow, and liquidity. To address this situation, the company obtained an investment from its now-DIP lender, HPS Investment Partners, in April 2018 for a new first lien credit facility. This provided the company with much needed liquidity and, in turn, briefly extended the company’s runway out of bankruptcy court. The “make-whole” provision attached to the facility, however, became the subject of much controversy and an ad hoc group of second lien noteholders sued in New York state court for an injunction to hinder the transaction. Ultimately, the state court denied the noteholders. Following the closing of the transaction, LBI sought to continue its growth efforts. However, such efforts were weakened by the Junior Noteholder Group, which continued to litigate against the Company, its founder and CEO, and HPS, the Company’s sole senior lender. The Junior Noteholder Group commenced multiple lawsuits, and threatened several more, distracting management from operations. These actions and threats not only hindered the Debtors’ efforts to improve their operations, but certain actions, including seeking to enjoin the first lien financing, risked pushing LBI into a precipitous freefall bankruptcy. When coupled with the Debtors’ tightening liquidity (which was exacerbated by the expense of the Junior Noteholder Group litigation), the Junior Noteholder Group’s actions made it substantially more difficult for LBI to achieve the growth it had hoped for, and the Company determined that a comprehensive reorganization may be necessary. Thereafter, settlement talks with the Junior Noteholders proved unsuccessful and, now, therefore, the company marches into bankruptcy court with a Restructuring Support Agreement (“RSA”) in hand with HPS whereby, subject to a “fiduciary out,” HPS will serve as (prearranged but hardly set in stone) Plan sponsor and swap its $233mm first lien senior secured notes for a majority equity interest in the company. The Plan — which at the time of this writing isn’t on the docket yet — reportedly provides for recoveries for other “supporting” constituencies. What’s that we hear? IT’S A (DEATH) TRAP!?! (PETITION NOTE: for the uninitiated, a “death trap plan” is an inartful term for when the Debtor proposes and the senior lenders allows a recovery to trickle down the “priority waterfall” to junior lenders but only on account of said junior lenders’ support of, or vote for, the proposed Plan. In essence, its consideration for dispensing with “holdup value.” A “fiduciary out” gives the Debtor flexibility to, despite the RSA, agree to an alternative transaction that bests the HPS transaction without penalty or the need to pay a “break-up fee.”). The plan provides the company with 75-day period to run a marketing process. While the company will market the company to potential strategic and financial investors, it is also making overtures to the Junior Noteholders to take out HPS’ claim(s) (without needing to satisfy the make-whole) and become the Plan sponsor such that it could walk away with 100% equity in the company. All of which is to say: don’t let the terms “RSA” and “Plan” fool you. This is far from a consensual case being presented to the Bankruptcy Court Judge wrapped up in a shiny bow. The Junior Noteholders have been fighting the company and HPS for months: there is no reason to suspect that that will stop now merely because the company is a chapter 11 debtor. New Chapter 11 Bankruptcy Filing - FR Dixie Holdings Corp.
Oilfield services company, Dixie Electric LLC, and its parent, FR Dixie Holdings Corp., have filed for Chapter 11 bankruptcy in the District of Delaware with a prepackaged plan of reorganization that eliminates $300mm of funded debt via a debt for equity swap. The privately-held (First Reserve) Houston-based provider of electrical infrastructure materials and services to the energy industry (primarily in the Permian and Bakken basins) has a commitment in hand for $17.5mm of DIP financing to fund the business in BK and $30mm in exit term loans to fund the business upon its emergence from BK. Operators have become increasingly focused on service costs and have pushed for rate cuts and reduced overtime and fixed-priced work. The Company was also increasingly bidding against other firms for work, further putting pressure on margins. As the oil and gas market has recovered, operators have remained focused on costs and, while the Company has been pushing for rate increases, there is still less overtime work and more fixed-price work than existed prior to the downturn. In addition, the Company is experiencing higher labor rates and has not been able to fully offset those labor rate increases with the additional pricing increases. Accordingly, the company has shut down business lines and stream-lined operations. The hope is that with a near-full deleveraging, it will be better positioned for the future. Given the support of its secured lenders and other parties in interest, the company appears headed in the right direction. The company seeks confirmation of its plan on December 13. Pennsylvania-based publicly-traded specialty pharma company, Egalet Corporation ($EGLT), filed for chapter 11 bankruptcy in the District of Delaware — the latest in a mini-trend of specialty pharma companies to work their way into bankruptcy court (i.e., Orexigen Therapeutics Inc., Bind Therapeutics, Concordia). The company intends to use the bankruptcy process to effectuate an acquisition of the assets of Iroko Pharmaceuticals Inc., a privately-held specialty pharma company focused on pain management therapies. The company and Iroko will enter into an asset purchase agreement in connection with and as part of a plan of reorganization, and Iroko will obtain 49% of the outstanding stock of the reorganized Egalet and $45mm of new senior secured notes. The acquisition will fortify the reorganized Egalet’s product-candidate lineup which already includes one anti-inflammatory nasal spray and one oral oxycodone formulation. This proposal is also supported by various holders of the company’s debt in the form of a restructuring support agreement. For the years ended December 31, 2017, 2016 and 2015, the Debtors reported net losses of approximately $69.4 million, $90.6 million and $57.9 million, respectively. These losses were a result of the Debtors’ continued investments in their commercialization capabilities, the Debtors’ research and development activities, the Debtors’ increasing debt service obligations and general difficulties in increasing the revenue generated from the Debtors’ marketed products, including challenges specific to the abuse-deterrent market such as shifting legislative and social responses to the opioid epidemic. On account of all of this, the company got a Nasdaq delisting which triggered a “fundamental change” under the company’s converts which required the company to buy back its converts. Of course, the company didn’t have the ability to do so under its credit docs. Ruh roh. Enter restructuring professionals here. The reorganized debtors will continue to operate under the Egalet name and will be positioned, post-acquisition, to market six commercial products. The company intends to use cash collateral to finance the cases and be out of bankruptcy within 95 days. Among the companies largest shareholders are Highbridge Capital Management LLC, Broadfin Capital LLC, Deerfield Management Company LP, and Franklin Advisors Inc.